I noticed that there wasn't a PEC lately, so I decided to start one. We will have 16 common Pokémon. Round one will end on the 11th of June on the time of this post. Last edited by Eeveelution-Master on Thu Aug 08, 2013 2:11 am, edited 4 times in total. I don't care if it's supposed to be a junior hyena. For me it's a junior wolf. And I like wolves./You know what was great about BW? You didn't read "Wild Zubat appeared!" 10 times a minute every time you placed a toe in a cave. Probably my favourite bird line in the games. / I hate this little bat with a passion. Got on shiny once, well two! Save the Zubat. It must survive as it is awesome. So cares if you get on every 30 seconds. They evolve into Crobat. One of the best pokemon on my list. Tentacruel is bad. Its basically a water Zubat, but it doesn't have a good evo. Since I can only vote on pokemon each round, this one is it. I love the little guy, no matter how many times I run into him. That's what repels are for, after all. And Crobat is one good final evolution. / Now this guy is just pathetic. I have never used a Rattata in any game, and never plan on it. Because BIDOOF/Need I explain? Rocks shouldn't explode. They just shouldn't. I really like Geodude mainly because I used one on my first ever run of Red back in the day / Sentret is one of those pokemon I always forget about it never really stood out to me at all. MY RATTATA IS IN THE TOP PERCENTAGE OF ALL RATTATA! / Poochyena is just kind of lame in my opinion. 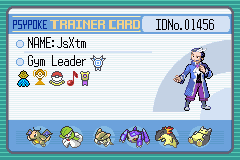 Alright, I'm playing Pokemon! Time to go through Mt. Moon! 4 up.... 4 down. ZUBAT, YOU MUST BE SAVED. DOWN WITH EVERYONE BUT ZUBAT. DOWN WITH EVERYONE BUT ZUBAT. And Tentacruel is better than Crobat . Zubat must live / I can never really remember Sentret. gets immunity and gets the boot. @James: It's Tentacool not Tentacruel! Round two will end on the 12th of June on the time of this post. Same reason as before / I've never really liked Rattata and they're evolve form isn't that good either. Last edited by Eeveelution-Master on Fri Jun 07, 2013 7:53 am, edited 3 times in total. Sentret shouldn't have been in this Elimination Challenge in the first place. It always gets lumped in with the Rattata and Zigzagoon of the world, but it's not actually common. Rattata was the Rattata of Johto. Reads through Twisteds post. I have the way of the ninja. But, my I will never live up to Master DNA. You know, Zubat is immune. No votes for it unfortunately. I like the roaring, wild wannabe style of it. It's made for big things. / The Zubat of the seas. And I hate its OPness in the Battle Subway. Last edited by ChillBill on Fri Jun 07, 2013 6:37 am, edited 1 time in total. got booted Chill and is immune James. In standard PEC rules, you can vote for a Pokemon to have immunity if it has immunity. Just not down voting it. I'm voting for Zubat to have immunity next round. Geodude for reasons I said previously / Pidove because it just looks bleh. Also, even though it was the common bird of Unova you didn't get it until the second gym rather than on the first route which always bothered me. 2. can't win immunity this round under rule 10 of the PEC rules.